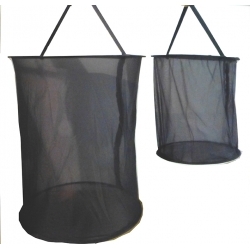 The Hanging Cage is particularly suitable for pairing Hawkmoths and Silkmoths. They are also suitable for breeding some butterfly species, by providing nectar plants and foodplant to lay on. The cage is normally suspended. When not in use, the cage stores perfectly flat, using almost no space. LARGE Approx 40cm diameter, 45 cm high. Suits larger moths. SMALL Approx 26cm diameter, 35cm high. Takes up less space. Much cheaper to post! Handmade with quality materials for lasting service.